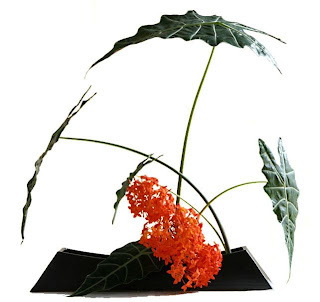 Here is another beautiful Ikebana work of Sensei Valeria. Over the years, in our annual exhibitions, I have experimented with urban waste, as a source of art and expression. Initially, I worked with various discarded auto parts - I had an old car that frequently threw up these various parts at me! I recall using these old silencers with the exhaust pipes forming the main lines! My father gave me some tips as to how to make them stand, and where I could fill water, for the fresh material! My mother of course was the sounding board and provided me the encouragement to try this idea. It was also the first time that I worked with limoneum, the everlasting flower, which was used to soften the harsh, metallic lines of the pipes. I imagined the creation to show how even in our urban jungles, there are spots of life (the red carnations! ), to brighten our life, and all we need to do is to look out for them. The next year, and I had some discarded radiators to work with! They provided "surfaces", but lacked colour and focus. Coloured berries and bleached and painted coconut fibre I thought provided a dramatic effect! 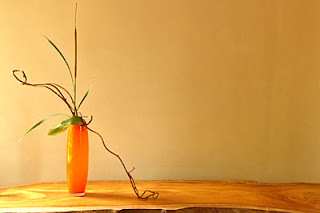 However, many of my friends who saw this stood in disbelief that I could call this Ikebana!! Like a mother defending her child though, I have a soft corner for this creation, and actually prefer it over my earlier attempt, which I thought was childish. The next year, we sold the car, and with it went my "source" of material! That was the time when the streets of Madras were all being dug up, and optic fibre cables were being laid. Wherever you looked you saw ditches with colourful plastic cables sticking out, causing my mother to exclaim that wouldn't those cables be a good material to work with for Ikebana! That was the inspiration behind the 2007 composition, which I labelled Urbania. It reminded me of a city's night life, neon lights and cars with headlights. 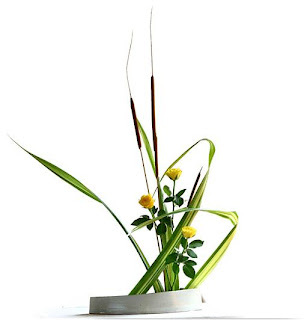 I have also used thermocol as a "vase", over the years. There's so much of it that lies around, coming as packing material with anything that you buy! And they have such interesting shapes and dramatic forms as well! I have enjoyed creating these works, but I know that quite often it does not appeal to the purist. For some reason though, I am drawn to the abstract designs that I see in these waste products, and enjoy the creative process of working with them! Going through the Flickr gallery, I was tempted to do a post highlighting the large works by Sensei Malathi, over these last few years! 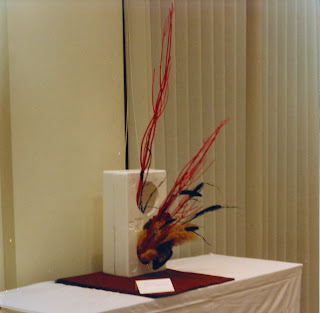 This was the large arrangement from the 2009 exhibition, where she said she drew inspiration from the pyramids of Egypt. For me however, they reminded me of a Japanese garden, with the swept stones, the spare branches with their strong lines, and the chrysanthemums, so ceremonial and sacred to the Japanese. This water pot from my grandfather's home in Mysore found a new use, in this age of plumbing and electric water heaters! The tall bamboos topped by elegant swirls was the feature of our 2007 exhibition. And 2006 saw Sensei Malathi use tall palms in a stylised fashion, with dramatic heliconia, for a tropical garden theme. My favourites are 2009 and 2007. What are yours?! Our friend Valeria from Pondicherry does one or two Ikebana to welcome her students at the Ikebana class. 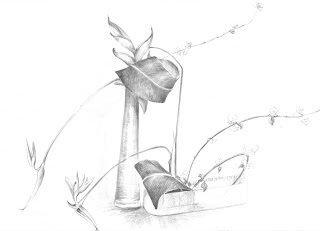 Two of her students are artists, and they like to do the drawing of the Ikebana. Nice drawing. I want to share it with our group. We have a lesson about sketching & drawing in book 3&4. I wish i could draw like this.. Thanks Valeria for the picture. Ikebana Teacher and Artist Valeria Raso visited our exhibition. She is Born in Sicily,Italy and has a Degree in Psychology at Padova University. She Sailed a yacht around the world for 8 years with her Japanese husband. 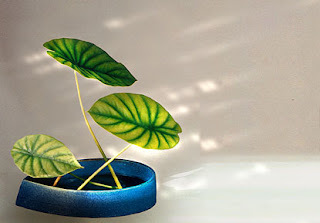 She lived in Japan for 14 years and studied Ikebana for 10 years at the Sogetsu School where she was awarded a teacher's degree,and the name "Suiren"(Lotus flower). Valeria is originally Italian but she professes a deeper identification with the Japanese culture. 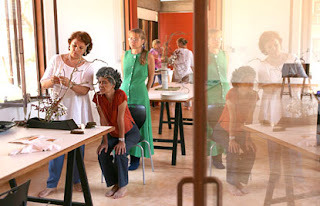 She lives in Auroville ,a international township in South India,with her husband and her daughter, and gives talks and classes on Ikebana all year round. 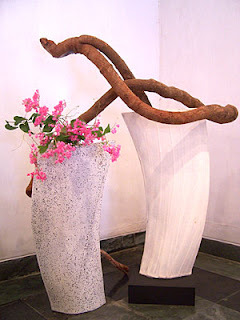 It was very nice of her to visit our Ikebana Exhibition in Chennai. Thank you Valeria, from all of us. 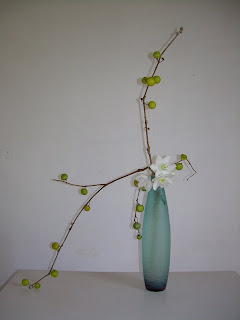 Here are some pictures of her Ikebana for our group. Take a look at the pictures of our exhibition last week. 70 exhibits I think there were. If any of you can identify arrangements that I may have left out, please let me know, and I'll add them.